"We stand at a moment in time where many people are disconnected from government, making it difficult to earn the trust of the public. I have been attending the protests on campus, which have stemmed from a decision to implement a two-tier system for classes, splitting the people who can afford them and the people who cannot. "Over the course of these protests our community has been divided and needs to be healed. In the times of this education crisis, we need to unite together and focus our attention to the problems in our state. We must ask ourselves; 'Why are prisons receiving more funding than schools?' I plan to empower students to be politically active and engaged to solve these problems. By uniting students together, everybody can be included into healthy democratic discussions." Jean finished first with 823 votes and 49.3% in a three-way race and succeeds fellow Green Harrison Wills, who was elected president in April 2011. Wills was one of four Greens elected that day, along with Jessica Chuan (Director of Financial Support), Marco Vivero (Director of Instructional Support to the Student Board) and Joshua Scuteri, who was elected as student trustee on the Santa Monica College Board of Trustees. By the end of their student government year in office, two other Student Board members registered Green as well, as well as many of the student staff support to the Board members, in part over the contract education issue, along with the efforts to green the campus food policy. Wills in particular was vocal and outspoken against the contract education plan, being quoted in much of the regional and national media coverage the issue gained, including after students were pepper-sprayed protesting the plan at a Trustees meeting. Neither Jean nor Wills are strangers to activism. 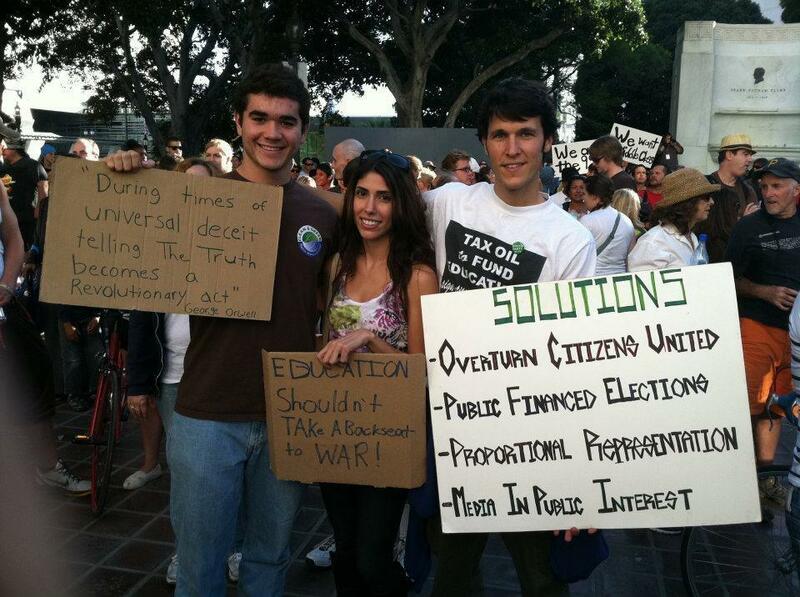 As pictured right, both were also active at Occupy LA in the fall of 2011, along with many other SMC students, including organizing Occupy events at SMC. They also helped bring Green presidential hopeful Jill Stein to SMC in December 2011. Stein later wrote about the SMC students struggles around the contract education system. Both Jean and Wills are candidates for the 2012-2014 County Council of the Green Party in Los Angeles County.